Keep on the lookout for things like needing sticking window repair and sticking door repair. 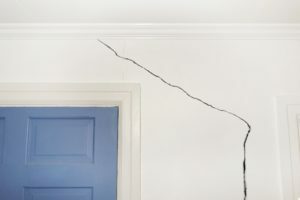 Watch for cracks in basements, slabs, and on sheetrock walls in the living areas of the house. Water puddles that form around the base of your home may also indicate foundation problems, as can upheaval of floors or floors that gradually become sloped or badly cracked. Upper-level soils, typically 6 to 8 feet below ground level, go through wet and dry cycles due to seasonal moisture and temperature changes. When there are drastic changes such as a heavy rainfall right after a drought, water moves through the soil at greater rates than normal. This water looks for the path of least resistance, if this path is through or under your foundation, settlement and cracks will start to appear. Soils with heavy concentrations of water can double in weight causing hydrostatic pressure to press against your foundation, or consolidate soils. This consolidation can cause your foundation to sink due to the lack of support. Steel push piers are designed to give new support to structures that have lost their original supporting soils. Like stilts, these underpinning products will not only stabilize a sinking foundation but they also can lift and hold the structure at it’s originally designed elevation. If you notice that your foundation is settling bring in a foundation engineer to analyze your situation and recommend a solution to fix it. Foundation repair contractors work directly you’re your engineer to carry out the engineers plan he has developed to stop your sinking foundation in Virginia. Reliable offers a wide variety of solutions for your foundation settlement problems. For foundation repair call us today!